Pity the person who has to write a job description for someone to fill the shoes of Sheilah Conner, who has spent 50 years working at Emory’s Oxford College — most of that time as the chief administrative assistant to eight different deans. Not that Conner would tell you this herself. 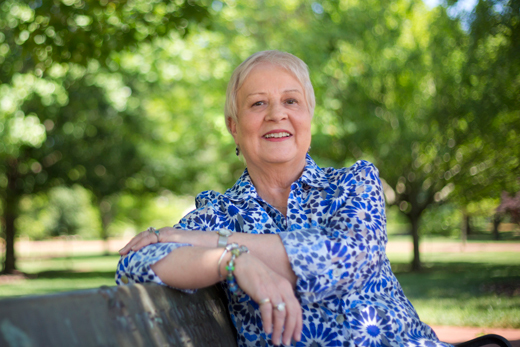 Although on the Oxford campus she’s known as the “go-to” person for all manner of current issues and historical perspectives, this soon-to-retire executive assistant has never been someone to crave the spotlight. “Sheilah’s not one to brag or take credit, but she certainly deserves it,” says Kitty McNeill, dean of the library at Oxford College, who has worked with Conner for the past 30 years. “A lot of people may not even realize all that she does behind the scenes, everything she does to make the pieces fit together,” she adds. From her work with special events, such as Commencement, Convocation and annual service awards, to human resources and budget issues, “it would be impossible to truly measure Sheilah’s impact on the success of Oxford College,” says McNeill. Oxford College Dean Stephen Bowen acknowledges that a job title doesn’t begin to tell the story of Conner’s wide-ranging contributions to the campus community. “Although her title is executive administrative assistant to the dean, her knowledge of Oxford College is so thorough that she is often called upon to help with payroll, accreditation reporting, budget management and more,” says Bowen, who is also William R. Kenan Jr. Professor of Biology at Oxford College. “The deans — and many others at Oxford — owe their success, in no small measure, to Sheilah’s competence, resourcefulness, discretion and cheerfulness,” he adds. In many ways, Conner grew up alongside Oxford College. A native of the area, she arrived at Oxford fresh out of Newton County High School. The college was seeking entry-level clerical help, Conner recalls, and had called the high school for a recommendation. With classes in shorthand and bookkeeping under her belt and strong typing skills, Conner was a natural pick. She began working in the registrar and admissions office in July 1964. Conner joined a campus-wide administrative support team consisting of five staffers, called secretaries at that time. It was a world of manual typewriters and carbon paper, clattering adding machines and mimeographs. Phones had just two lines — one local, the other to Atlanta — and office computers were still decades away from reality. Soon, Conner was asked to fill in as an administrative assistant to then-Dean Virgil Eady. Within four years, Oxford’s next dean, Bond Fleming, hired her to serve the dean’s office on a permanent basis, and she’s remained there ever since. “Her role required a sort of aptitude for change that is extraordinary,” says Joe Moon, Oxford’s dean of Campus Life, who has worked with Conner for nearly 40 years. The Oxford College that Conner joined in 1964 was a very different place than the campus she now leaves. In conversations with former Oxford deans while researching his book, Moon discovered that in many ways, “Sheilah figured in there as an unattributed character — a stable bass note to the community,” he says. As Conner, who will work through June, now prepares to step away from her beloved campus community, colleagues say she’ll be remembered for her trusted, unflappable, hospitable presence and her resilience in adapting to never-ending change, from administrative processes to technological advances to personnel. “Not only can Sheilah do the work and change with the work, but she does it well and helps you feel like you belong here, no matter what,” says Oxford College Chaplain Lyn Pace. Pace notes that in this day and age, it’s unusual to find someone who stays in the same job for 50 years. Emory University human resource officers acknowledge that it’s rare; in the past decade, only a few employees have achieved that mark. To her colleagues, Sheilah Conner has been, quite simply, an anchor. “We’ll fill her position but we’ll never replace her,” notes McNeill.